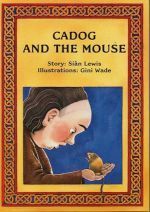 A Welsh folk-tale about Cadog the monk aiding the starving people of Brecon to find food, with the help of a little mouse, colourfully retold for 3-7 year old children. Welsh version Cadog a'r Llygoden also available. This is a simple story, simply told. Cadog the monk visits his friend in Brecknock, only to discover that famine has come upon the people. The crops have failed. The monk, however, is befriended by a mouse, who leads him to an unexpected treasure trove of corn. The illustrations will be appreciated by both children and adults. The children will like the details and enjoy finding the mouse as it peeps out in many of the pictures. Older readers will appreciate the Celtic designs – the intricate knot borders and the medieval initial which adorns the first page as it does in old manuscripts.